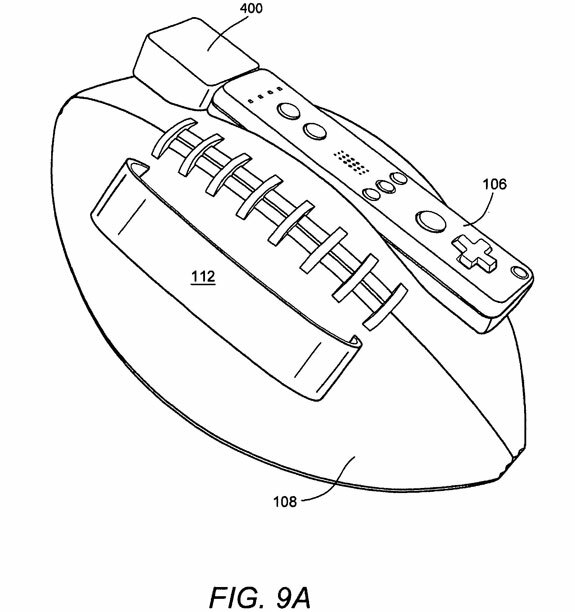 The Coming Nintendo Wii Football Controller? One of the best ways to foresee what’s coming down the gadget pike is to check out company patent filings. Though, of course, a patent for a product being filed doesn’t automatically mean the product will become reality. 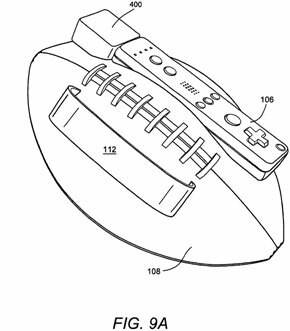 With that caveat we bring you this bit of cool news: according to the excellent website Nintendo World Report a patent has been filed for a Wii interactive football controller. 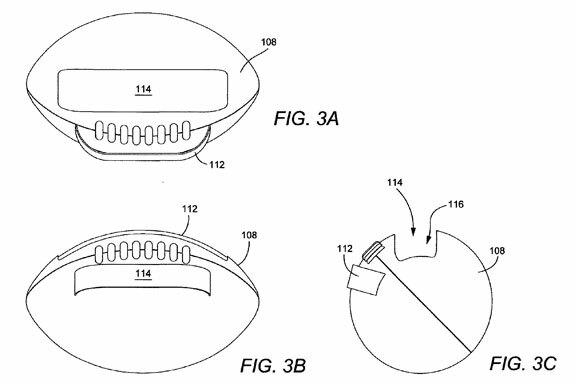 Based on the filing and the associated sketches (see below) the foreseen Wii football will have a soft exterior and be a bit smaller than a real football. It will have special buttons as well as incorporate the current, standard Wii controller into the design. How will it work? That depends on what sort of virtual football play you are running. For a passing play the player straps their hand into the football and makes a throwing motion—the speed and angle of the motion will determine where the ball goes. Buttons on the football will control other aspects of the play before and after the pass. 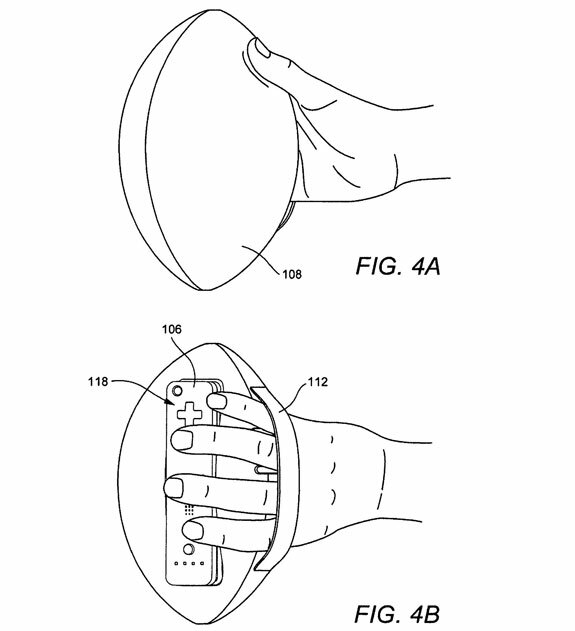 For a running play the controller will sense the motion of the faux football in the player’s arms. The faster the player makes a jogging motion the faster his virtual self will run. The football can be moved side to side to dodge tacklers, or lifted up to jump over them. That all sounds very tiring to us. But then a Wii football game using this as-yet theoretical controller certainly wouldn’t be the first Wii controller to involve aerobic exercise. (Think Wii Fit or even the Guitar Hero kit). As for our many questions—like how one would play defense with this controller or how hard it will be to throw an accurate pass—we very much hope =this controller becomes a reality so we can experience the answers for ourselves. 8 Highly Unusual Items You Can Buy on Amazon.com – really! Wow.. that new controller looks awesome. But i think gamers must be careful not to throw this controller as if they’re throwing a real ball. 😀 I think i can see Nintendo or other console makers will file similar patent like this but in different shape. Maybe soccer shoes for soccer game. That would be really awesome if we can really play a soccer game like FIFA or PES and act like we’re playing a real soccer match in our house with these shoes. Just can’t imagine how awesome it would be. 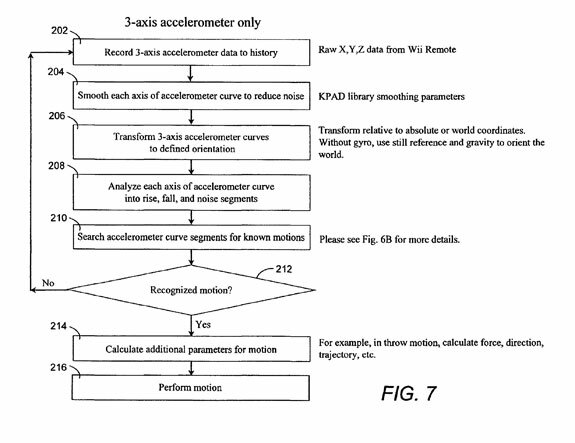 It’s really cool that they were able to figure this out from the patent. As a football fan, I would definitely be into this and it seems like it would be a pretty realistic experience. I hope they actually end up developing it.